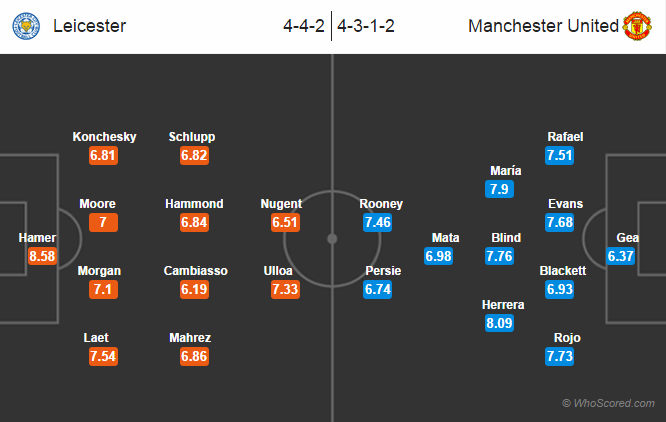 Possible Lineups: Leicester City vs Manchester United. The Red Devils are unbeaten in their last five meetings against Leicester City. Leicester City will host Manchester United today in an early game of the Premier League. Both the sides are eager to get their second win of the season. Both the sides have earned four points. Manchester United are unbeaten in their last five meetings against Leicester City. The last time won was in Leicester City 1997-1998 season. Chris Smalling is back from groin injury but Phil Jones is out with Hamstring injury. Midfielders Michael Carrick and Marouane Fellaini are both out with an ankle problem. Winger Ashley Young is still recovering from a groin injury. Summer signing Luke Shaw is hopefully going to make his debut today. While for the away side, Esteban Cambiasso is set to start this fixture after impressing last weekend against Stoke City. Kasper Schmeichel is back from a ligament strain, the goalkeeper missed the last game. While on loan attacker Nick Powell is ineligible to feature against his parent club. Leicester City 1 – 2 Man United, hopefully Van Gaal is going get his second win of the season.